The exhibition illustrates the changes in Basque society in the course of the 19th century, and looks at the causes, the key issues and the consequences in the Basque Country of the Carlist Wars. The rise of liberalism upset the already precarious social, political and economic balance. The change was too sudden to be peaceful, and the minor nobility were split. As a result, within the Zumalacárregui family some clung to tradition while others sought to break with it. The Zumalacárregui family belonged to a class of minor nobility that was particularly numerous in the Basque Country. Their daughters went into marriage with good dowries and their sons were given an education with a view to their serving letters, the church or the army. Tomás Zumalacárregui was the second youngest of 14 siblings. His family decided that he should be a clerk, like his father. If the war had not changed his fate he would probably have led a quiet life much like that of his parents. Up to that time Miguel Zumalacárregui, Tomás’ older brother, had been the most prominent member of the family. He was active in politics as a moderate liberal, took part in the assembly known as the Cadiz Cortes and was among the writers of the Constitution of 1812. He occupied a number of posts including Mayor of San Sebastián, Senator and Minister for Grace and Justice. The confrontation between the defenders of the ancien regime and the supporters of liberalism began in the late 18th century and was to continue throughout Zumalacárregui’s life. The middle classes sought to limit the absolute power of the monarchy and rein in the privileges enjoyed by the nobility and the clergy. A number of earlier conflicts paved the way for the First Carlist War in the Basque Country. On the one hand this resulted in a period of social and economic crisis, but on the other it gave military experience to many who were to play leading roles. In the Basque Country defending the ancien regime meant defending the “Fueros”, the last surviving specific local legislative framework in the kingdom of Spain. That is why the area became the main backdrop for the First Carlist War. 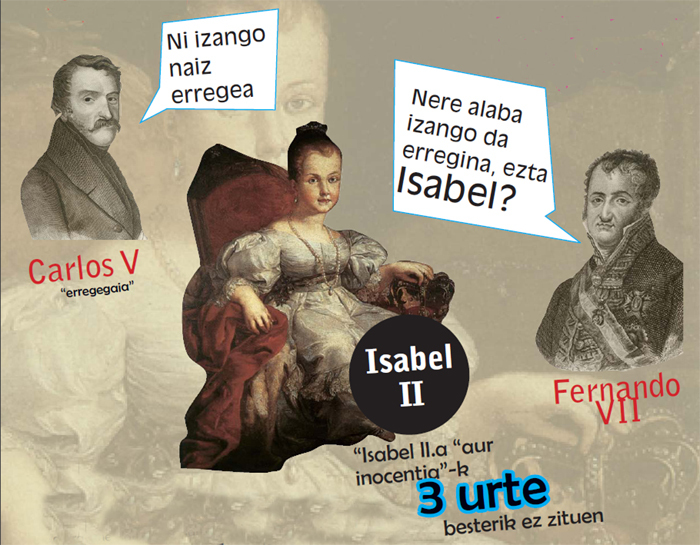 The First Carlist War broke out as a result of dynastic problems when Ferdinand VII overlooked his brother Charles and named his daughter Isabel as his heir.